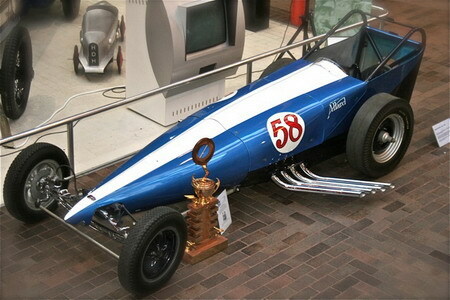 Dragster Update - The Birth of "Ally Blue"
A few weeks ago, Brian Taylor of the Allard Chrylser Action Group that is restoring the Dragster - sent us this story about what's likely the first Allard inspired song out there. 50% of the proceeds will go to help restore the Dragster. Sam Eidy of Michigan engine builder Booth Arons has been a complete Ally project addict since his company first became involved in the restoration of Europe’s oldest dragster – the 1961 Allard Chrysler built by Sydney Allard. Shortly after Booth-Arons was appointed the official engine builders for the project, and between locating and chasing down parts suppliers, Sam found himself doodling out some lyrics about the car to the tune of ‘Alley Oop’. Although originally written for a comic strip of the same name by Dallas Frazier who recorded it in 1957, the ‘Alley Oop’ version by the Hollywood Argyles in 1960 is probably the most well known because it made Number 1 in the Billboard Hot 100. But it has also been recorded by other artists such as the Beach Boys and George Thorougood and is familiar to most rock music fans of a ‘certain age’. Sam e-mailed his new lyrics to others involved with the restoration to get comments, and Project 1320 Chairman Traci Hrudka (Co Patron of the Allard Chrysler Action Group) sent them on to her guitar playing friend Ked (the Polar Bear) Dieter in Canada whose song Thunder in the Distance by KED and Big Blue Hammer was (and still is) being used on the Project 1320 website. Ked is also Vice President of Mixposure’s MixStreamRadio. A rocker through and through, he normally plays a 95 Gibson LesPaul guitar. But an avid ‘guitar hot-rodder’, and a pro level luthier and guitar technician, he has another ten guitars in his collection, including a unique replica of a Gibson Flying V solid guitar. Being a drag racing and stock car fan he was immediately hooked by the restoration project and Sam’s lyrics. He made contact with Sam and they set about re-working the lyrics, melody and arrangement so there would be no copyright infringements, and laid down a new version of the song that featured Ked’s rocking guitar and vocals plus a Beach Boy styled harmony by Mack Sanders. Ked produced the work and played all the other instruments. This was e-mailed around interested parties (including ACAG Co-Patron Nick Mason) who added their own suggestions about the arrangement and mix, resulting in the final version including sounds of the Allard Chrysler recorded in 1964 at Blackbushe in England, plus the voices of Gerry Belton, Sydney Allard and Tommy Ivo recorded at the same meeting. Hence Ally Blue; a unique piece of music about Ally that can be used by the ACAG for promotional purposes to help raise funds. It currently features on the ACAG website and will be used in electronic press release activity. Not only that, it is now available as a download direct via www.kedrecords.com or via a link from www.allardchrysler.org. A Pay Pal facility is available and half the download fee of 99 cents (US) goes to the Allard Chrysler dragster restoration fund. The song’s lyrics are also laid out in detail. At the moment Ked is repainting his replica Flying V in Allard Chrysler colours, as an extra tribute to Sydney Allard and his important role in spreading drag racing across the Atlantic. It will be called the Allard 58. If there is enough interest, arrangements will be made regarding licensing Ked to produce the guitar for resale using the Allard brand, with profits going towards the restoration fund.